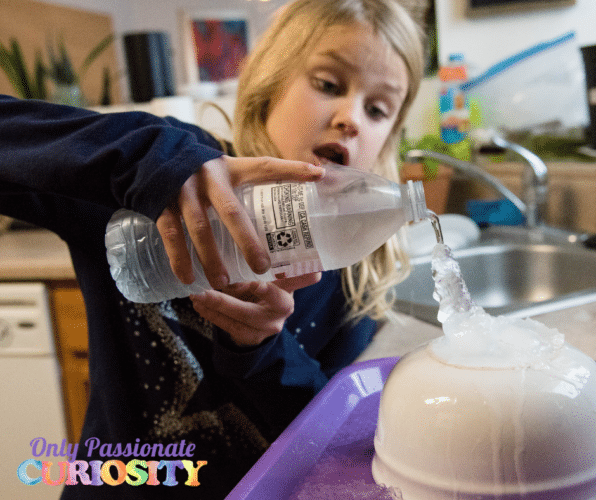 This easy science experiment requires very few supplies, but has a big impact. 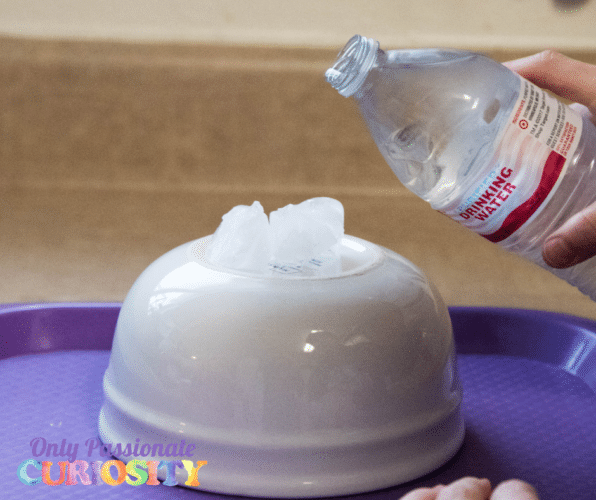 Pour liquid water and watch it magically turn into ice before your eyes! Put water bottles in the freezer for two hours. Lay them on their side for the best results, but try not to dent the plastic bottles. Place a ceramic bowl upside down on a flat surface like a tray to catch the water overage. Place an ice cube on top of the pouring surface. Then SLOWLY pour while instant ice forms! This simple but amazing experiment is more than just a cool one. The science behind it lies in the freezing temperature of water and how ice crystals form. 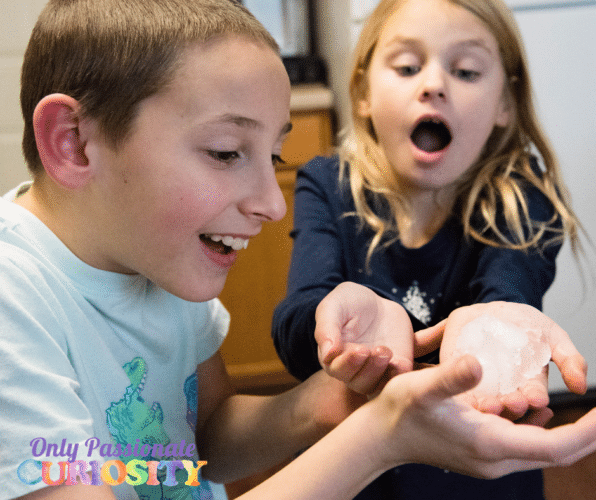 This is also referred to as Supercooled Water or Flash Freezing. When this freezing temperature is reached, the water molecules freeze by forming ice crystals. And the reason we choose to put an ice cube on top of the bowl, is because it’s easier for the water molecules to turn to ice on top of already formed crystals. As the ice crystals build on existing ice crystals, they eventually freeze the entire bottle of water. The process of starting the ice crystals is called “nucleation.” This starts from an impurity or scratch or piece of dust on the container holding the water. In this case, the water bottle. One ice crystal attaches to the imperfection, and the others grow on top. Isn’t science cool?! Would the experiment work the same if the water had food coloring in it? Would the results be the same if you started with hot water in the bottles before you put them in the freezer? Does the temperature in the room change the results? 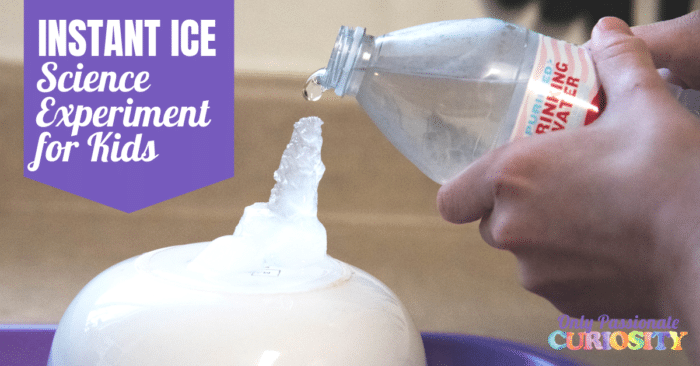 How high of an ice tower can you pour before it breaks? Want to dive deeper? 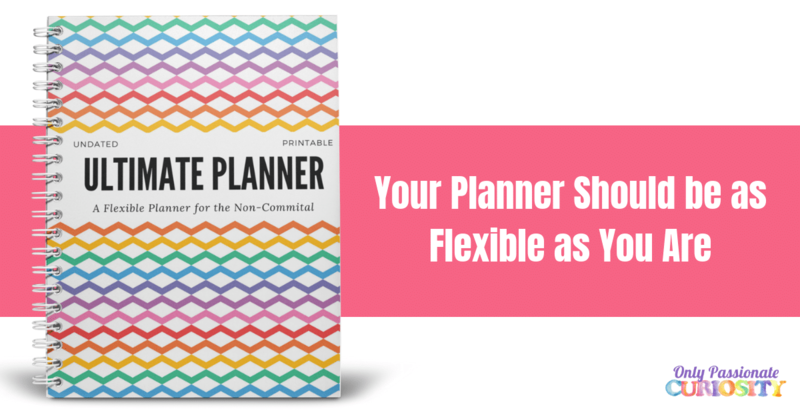 Check out these fun resources! 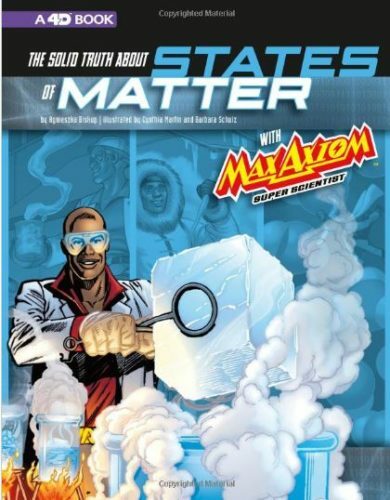 The Solid Truth about States of Matter–This graphic novel with colorful pictures throughout will help your students learn basic science truths in a fun format! 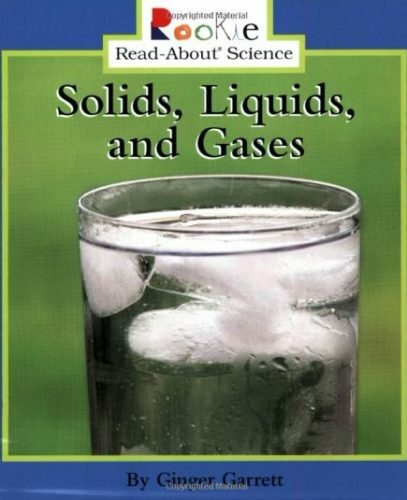 Rookie Read About Science: Solids, Liquids, and Gases– This 5″ x 7″ book uses three examples and lot of colorful photos to illustrate the different states of matter. 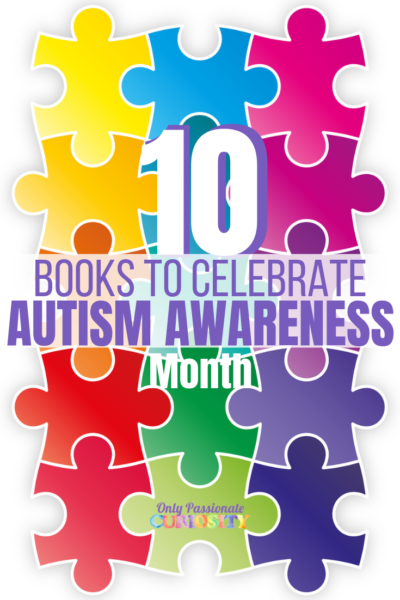 The text is simple and direct and perfect for young students. 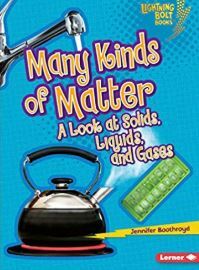 Many Kinds of Matter–This jewel of a science book is just the right of information for teaching this topic. 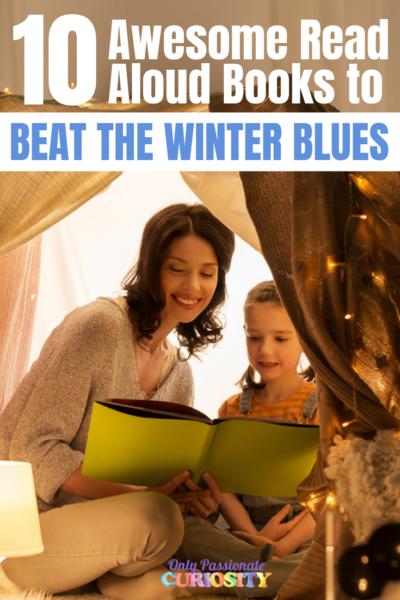 Colorful photos and understandable text make this one my favorites! Crash Course: Wood, Water, and Properties: If you’re not watching Crash Course on YouTube, you are missing a diamond in the rough! 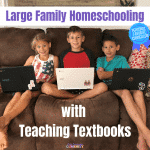 This episode teaches concepts in a way that other kids love! Why does water expand when it freezes-Naked Science: This fun format uses high-speed drawings and simple text to get the point across. I dare you to try to stop watching! Brain Stuff–How Can Hot Water Freeze Faster Than Cold Water–All of Brain Stuff’s videos are so well done. You can tell they’re big budget and are pros at this YouTube platform! Enjoy!